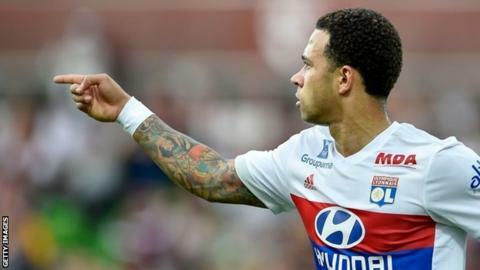 Former Manchester United winger Memphis Depay had a hand in all five goals as Lyon thrashed Metz. He is the first player in the top five European leagues to assist four goals in a game since Santi Cazorla for Arsenal against Wigan in May 2013. The Netherlands forward assisted two Marcelo headers - one in the first minute - with corners before latching onto a through ball to score himself. Depay then set up Bertrand Traore and Mariano to complete the win. Match ends, Metz 0, Lyon 5. Second Half ends, Metz 0, Lyon 5. Attempt blocked. Mathieu Dossevi (Metz) right footed shot from the left side of the box is blocked. Assisted by Nolan Roux. Ferland Mendy (Lyon) wins a free kick in the defensive half. Foul by Iván Balliu (Metz). Goal! Metz 0, Lyon 5. Mariano (Lyon) left footed shot from the centre of the box to the bottom right corner. Assisted by Memphis Depay. Attempt saved. Mariano (Lyon) right footed shot from the centre of the box is saved in the centre of the goal. Substitution, Metz. Gerónimo Poblete replaces Florent Mollet. Substitution, Lyon. Pape Cheikh replaces Tanguy NDombele. Foul by Mathieu Dossevi (Metz). Attempt saved. Emmanuel Rivière (Metz) right footed shot from the right side of the box is saved in the centre of the goal. Assisted by Renaud Cohade. Attempt missed. Nolan Roux (Metz) right footed shot from outside the box is close, but misses to the right. Assisted by Emmanuel Rivière. Substitution, Lyon. Amine Gouiri replaces Houssem Aouar. Rafael (Lyon) wins a free kick on the right wing. Foul by Nolan Roux (Metz). Attempt missed. Memphis Depay (Lyon) right footed shot from the centre of the box misses to the left. Assisted by Ferland Mendy. Substitution, Metz. Jonathan Rivierez replaces Julian Palmieri because of an injury. Corner, Metz. Conceded by Anthony Lopes. Attempt saved. Renaud Cohade (Metz) right footed shot from outside the box is saved in the top left corner. Assisted by Emmanuel Rivière. Memphis Depay (Lyon) wins a free kick on the right wing. Foul by Moussa Niakhate (Metz). Attempt missed. Mariano (Lyon) right footed shot from the centre of the box misses to the right. Assisted by Rafael with a cross. Substitution, Lyon. Mariano replaces Bertrand Traoré. Attempt blocked. Memphis Depay (Lyon) right footed shot from outside the box is blocked. Assisted by Houssem Aouar. Goal! Metz 0, Lyon 4. Bertrand Traoré (Lyon) left footed shot from the centre of the box to the bottom right corner. Assisted by Memphis Depay. Goal! Metz 0, Lyon 3. Memphis Depay (Lyon) right footed shot from the right side of the box to the bottom left corner. Assisted by Tanguy NDombele with a through ball. Julian Palmieri (Metz) wins a free kick on the left wing. Attempt missed. Memphis Depay (Lyon) right footed shot from outside the box is high and wide to the left from a direct free kick. Moussa Niakhate (Metz) is shown the yellow card for a bad foul. Bertrand Traoré (Lyon) wins a free kick in the attacking half. Attempt missed. Memphis Depay (Lyon) right footed shot from the centre of the box is too high. Assisted by Bertrand Traoré. Corner, Metz. Conceded by Ferland Mendy. Attempt blocked. Nolan Roux (Metz) right footed shot from the centre of the box is blocked. Assisted by Mathieu Dossevi. Nolan Roux (Metz) wins a free kick on the left wing. Jérémy Morel (Lyon) wins a free kick in the defensive half.